One week from now I'll be walking around Paris! I can't stop thinking about my upcoming vacation. Next week we'll be making stops in Paris, Venice and Nice and I've already packed my wardrobe but I think I may have to add this one. Most of clothing for the trip consists of pinks, blues, and creams so this top and skirt combo would fit right in. 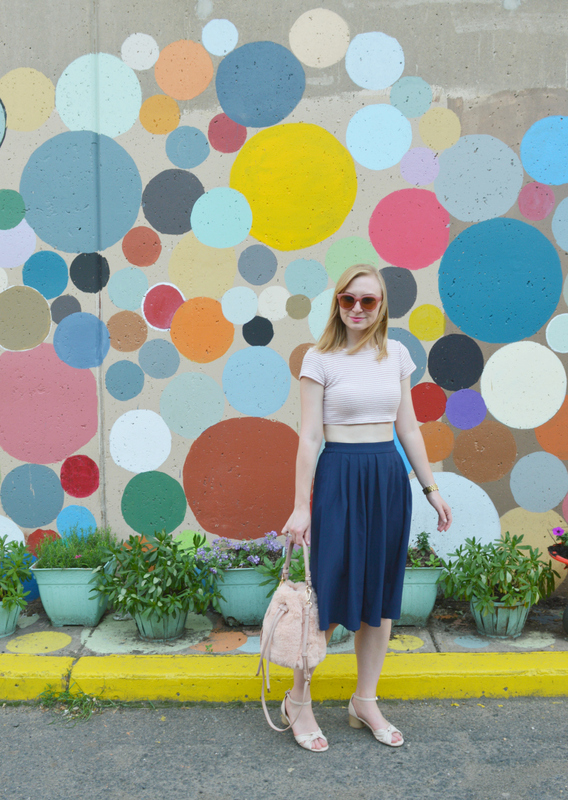 Plus, this high-waisted navy skirt is such a classic piece and goes with everything. 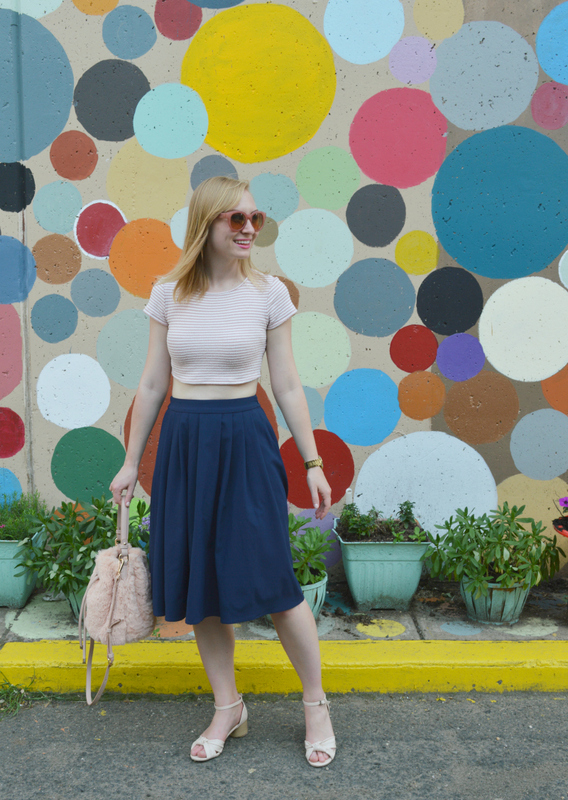 I love pairing high-waisted skirts with crop tops! I prefer to keep my belly button hidden so it's a perfect combo. 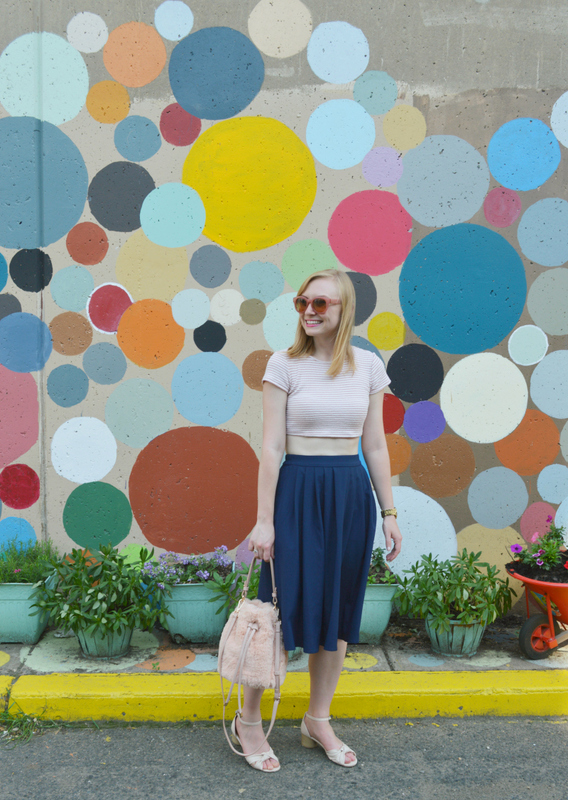 What are your favorite outfit combos for summertime? If you have any recommendations for Paris, Nice or Venice I would love to hear them! I've been to Paris a few times but I always love hearing about everyone's favorite places. I've never been to Nice or Venice and we don't have too much planned yet so I would love to hear what we should check out! No doubt you will enjoy your stay in Italy and France a lot ;) This outfit is very nice and perfect for current weather we have now here so yes you should take it with you! That look is so cute, and fun! I love the skirt. I don't usually like exposing my body too much, so I don't wear crop tops often, but I'm trying to be more comfortable with my body, and honestly, it feels great to wear a crop top when it's hot out. I've been wearing crop tops with high waisted jeans, but soon it's gonna get too hot for high waisted jeans. I don't have any other high waisted clothing though, so I might have to do some shopping :P // omggg have such a great time on vacation! Here is my post from Paris and here is my post from Venice. There were two cafes I wanted to check out in Paris that I didn't have enough time to go in but saw from the outside: La Maison Rose & Au Vieux Paris. And of course Cafe de Flore is popular and pretty, but I heard that it isn't worth it. I didn't prepare well for my Paris trip, but I was there for only a brief time and for the first time, so I hit up some obvious places (still didn't have enough time to visit nearly as many of them as I wanted), and I also spent some time with a friend who took me places. In Venice, I loved the restaurant Al Portego, and recommended it to some friends, and they loved it too! I didn't prepare for this trip either, but my readers recommended some places to me after I had shared about it on my blog. My favourite recommendation was Libreria Acqua Alta, a unique bookstore. Some people also recommended the Murano glass factory, if you're into that.